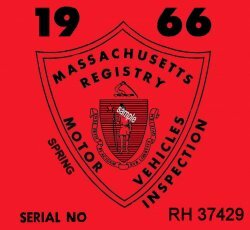 1966 Massachusetts SPRING Inspection Sticker - $20.00 : Bob Hoyts Classic Inspection Stickers, Add a Final Touch to your Restoration! This is a 1966 Massachusetts SPRING INSPECTION Sticker. They were issued from April to October, 1965. It has been carefully restored and reproduced actually better than the originals. For an additional $10.00 you can order your own License plate number added to the front of this sticker where the serial number now resides. This sticker has our patented "peel and stick" format which allows you to fasten it to the inside of your windshield. They are UV treated to help prevent fading.